TTL Converters and Flash Triggers are electronics that trigger your strobe to fire when using your underwater camera. They replace using your camera's internal flash to trigger the strobe. What is a Flash Trigger? This is a small electronic component that can replace the functionality of your camera's internal flash. It uses 2 small LED lights and is attached to your camera's hotshoe. it uses fiber optics to fire the strobe. There are a few advantages of using a flash trigger, first, fast recycle time. Instead of waiting for your internal flash to recycle, this would be much quicker since it is just using 2 small LED lights. Secondly, this would save on your cameras battery life, since it has its own battery and would not eat up your camera's battery life. Another advantage, it that it has less heat build-up inside the housing. One downside of flash triggers is that they can not be used in TTL mode. What is a TTL Converter? This is also a small electronic component which can be attached to your camera inside the housing. 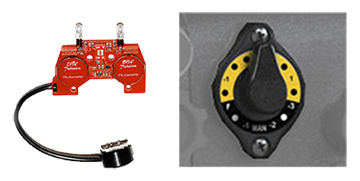 It is similar to a flash trigger, but it has the additional capability of TTL functionality. The strobe can be fired via either fiber optics, or an electronic sync cord. 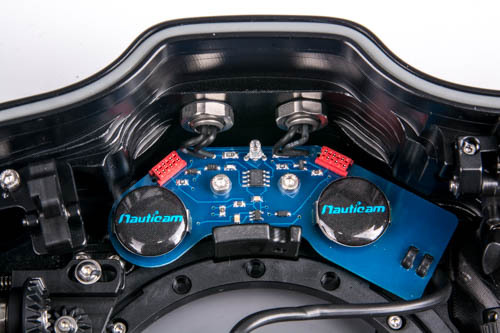 Optional Nauticam Flash Trigger Prism for Canon 1DX, 5D Mk III and 6D housings for more reliable triggering. 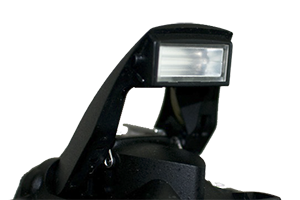 Many strobes have built-in TTL functionality. The TTL mode of your strobe can be used with the strobes below using the camera's built-in flash. Information on the different TTL Converters and Flash Triggers Available.